What's the weather going to be today? Definitely for the man who has everything. 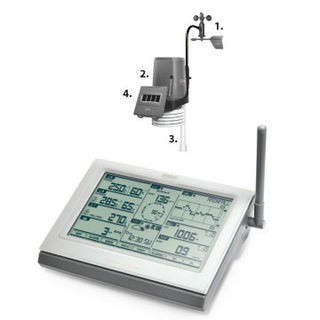 All sorts of weather stations from the simple to the complex, the inexpensive to the small mortgage. Just have a look at what there is now available for him to play with. 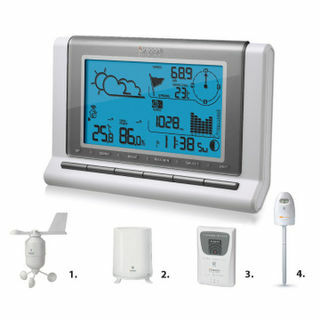 Offering state-of-the-art-technology the digital weather station comes with a wireless outdoor sensor that transmits data to the receiver where the information is displayed on the LCD screen. 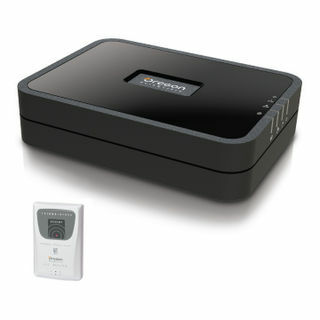 The receiver can be placed in kitchen, family room, bedroom, dining room, office, den or any convenient location. 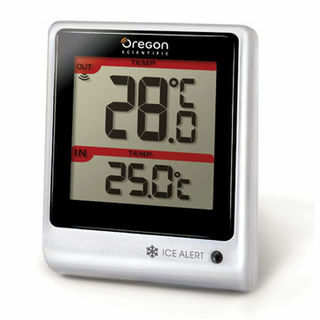 Temperature and other information from indoors or outdoors is easily seen along with various other weather related data. 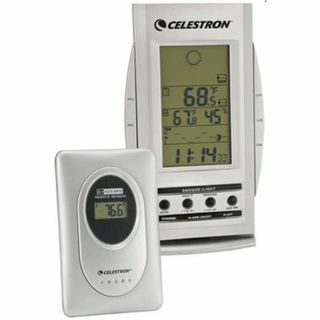 Displays indoor/outdoor temperature and humidity. Animated weather forecast includes sunny, partly cloudy, cloudy and rainy icons. Powered by 2 x CR2032 button cell batteries for main unit and 1 x AA battery for sensor. 1 X Outdoor Thermometer RGTN318 Sensor (included). 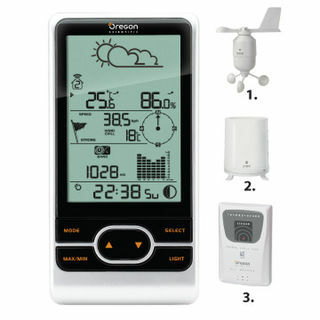 Multi-zone weather station with large LCD display to view all readings from sensors in 4 different locations at a glance. Weather forecast up to a day in advance using 5 easy to read icons – Sunny, Partly Cloudy, Cloudy, Rainy and Snowy. Button–free design updates weather data automatically. Iconic weather forecast – sunny, partly cloudy, cloudy, rainy, snowy. Indoor and outdoor temperature and humidity. Display wind speed and direction, wind chill and humidity. Barometric reading with bar graph. This weather platform syncs up with Oregon Scientific’s professional weather stations and uses traditional wireless frequencies and a hub to convert weather data into up-loadable information to a personal website or via a smartphone (iOS and Android) app. The platform allows homeowners to stay on top of real–time weather conditions at preset locations around the house monitoring microclimate from afar – including basements, attics, gardens and garages. 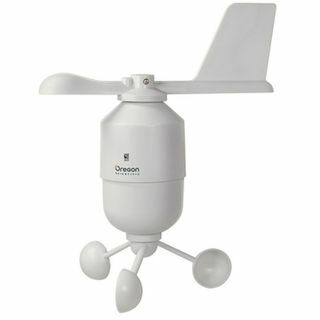 An additional or replacement wind speed and direction sensor from Oregon Scientific of the USA. The gentle crystalline glow sooths the spirit and also tells the weather. 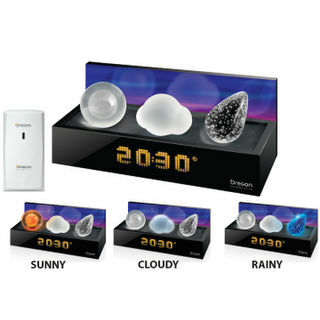 Weather forecast via 3 iconic crystals (sunny, cloudy, rainy). Changing light display for current weather forecast. 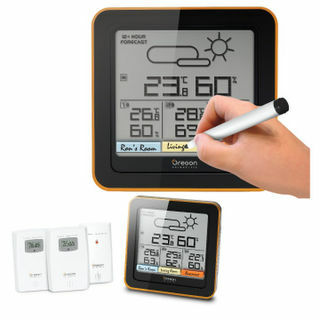 Indoor and outdoor temperature (up to 3 channels). Toggle between display modes via auto  toggle feature or a wave of the hand. Display mode demonstrates the lighting effects. Dual line daylight projection of weather-forecast-icon, time and alarm status. Projection arm allows 180 degree flip to project on wall or ceiling. 2 minute crescendo alarm with 8 minute snooze. 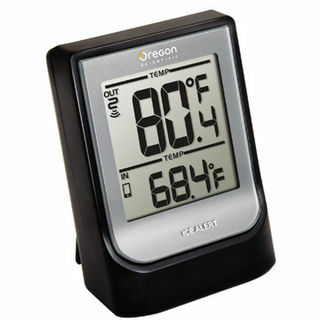 Displays indoor / outdoor temperature with daily Max. and Min. memory. Animated weather forecast includes sunny, partly cloudy, cloudy, rainy and snowy icons. 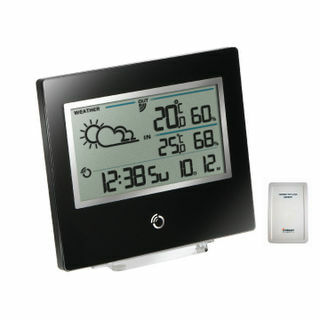 Monitors up to 3 wireless temperature and humidity sensors. Connects to the following wireless sensors: wind rain and temperature/humidity. Touch Screen for easy operation. 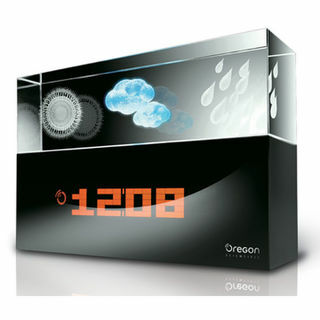 Built in Data logger allows data storage of up to 1 year. Variable settings to suit your needs. Current and 24–hour historical readings with timestamp. Supports indoor and up to 10 wireless outdoor temperature and humidity sensors. Compatible with sensors bearing the code 3.0. Connects to one wind sensor, one rain sensor, one temperature/ humidity sensor and one UV sensor (optional). Collects UV data and UV Index readings and provides a risk message: Low Med High Very High Extreme. 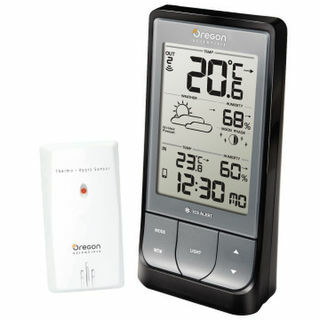 Compatible with Oregon Wireless Advanced Pro Weather Station. Transmission range: Up to 100 meters (open area). Wall mount or stake apparatus for insertion into the ground. Includes 2 AA 1.5 V Batteries. The weather platform syncs up with Oregon Scientific’s professional weather stations and uses traditional wireless frequencies and a hub to convert weather data into up–loadable information to a personal website or via a smartphone (iOS or Android) app. The platform allows homeowners to stay on top of real – time weather conditions at preset locations around the house monitoring microclimate from afar – including basements, attics, gardens and garages. Innovative weather station with laser engraved 3D icons in crystal. Weather forecast 3D icons illuminated by colourful lighting. 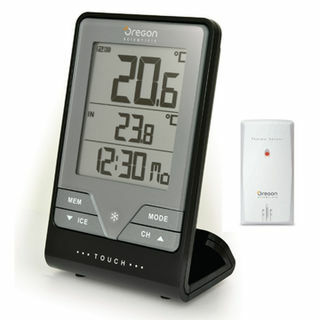 Change the display mode between time and indoor temperature with hand motion. The THG328 Oregon Scientific Window Thermometer displays the current temperature and the minimum and maximum for the past 24 hours. 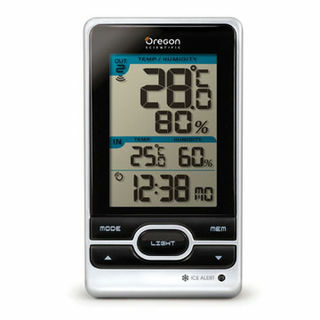 Indoor/Outdoor remote sensing thermometer from Oregon Scientific. A control unit displaying the local temperature and humidity. Perfect precision for weather-sensitive industries, researchers and professionals from Oregon Scientific of the USA. Professional quality weather station & outdoor sensor system. Graphical display of up to 24 months of detailed weather data at a time. Comprehensive weather information, including forecast, indoor/outdoor temperature, humidity, barometric pressure, wind speed/direction, rainfall, heat index and dew point. Tangential data including sunrise/sunset time and moon phase. 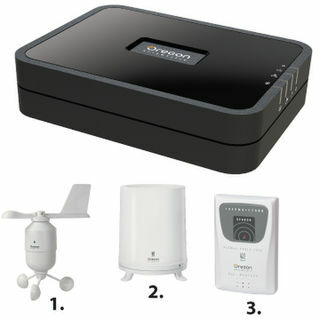 Includes main unit, 1 thermo-hygro sensor, 1 rain gauge and 1 wind sensor. 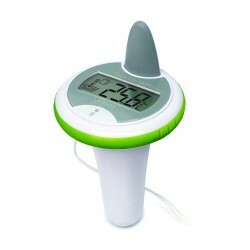 Touch & Slide wireless indoor/outdoor thermometer with clock. 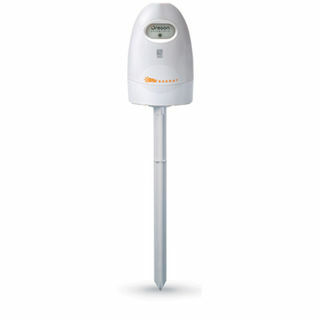 Stay up to date with the latest conditions with this wireless desktop thermometer. 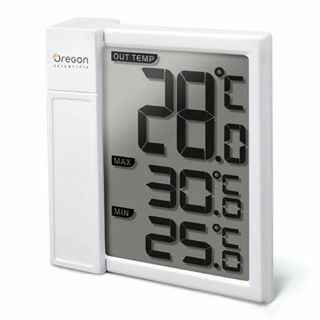 This unit records both indoor and outdoor temperatures in up to 3 locations which is perfect for the home or office. With the Ice Alert visual, a LED light warns you when temperatures drop low enough for frost or ice, making this compact and easy to read thermometer ideal for gardeners and motorists alike. 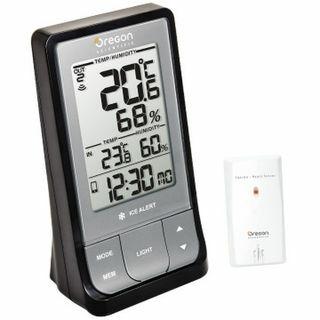 Weather station low energy Bluetooth with indoor/outdoor thermometer. Offering you the added convenience of app connectivity. Weather@Home lets you view updates via either its main unit or Bluetooth Low Energy (BLE) enabled smart device. Weather information display on main unit or mobile app via Bluetooth v4.0 connectivity. Transmission range up to 50m. 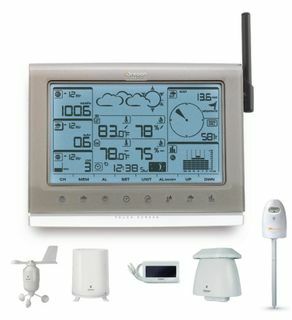 Bluetooth low energy weather station with temperature and humidity displays. 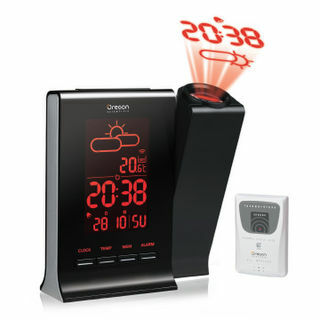 Weather@Home lets you view weather updates via either its main unit or Bluetooth Low Energy (BLE) enabled smart device. Low energy Bluetooth weather station with temperature, humidity and weather forecast. Offering you the added convenience of app connectivity, Weather-at-Home lets you view weather updates via either its main unit or Bluetooth Low Energy (BLE) enabled smart device.